Thread: What sort of rock is this? #1 What sort of rock is this? What am I looking at here exactly? My first guess was just common chert. Then I thought that it may be limestone, given the texture of the bit of gray area. I red that Limestone can have impurities to make it red in some areas. But it's like the texture changes where the color changes. The gray is rough while the brown/red areas are a bit more smooth. I took it in to my science professor and he said he really wasn't sure where to begin looking either. He said the closest thing he could relate it to was jasper which, when he showed me a piece, does seem to resemble the brown areas on what I'm showing below. My best guess is still that it's just limestone, but I'm not extremely knowledgeable in this area. Anyone else know, or at least have better ideas? Do you have any information on where the rock if from, and what the local geology is? Also clearer pictures and closeups are needed to get any ideas. PCMoon, Hi, you may find the rock key at the following link helpful. Limestone will react with vinagar. The grey area's texture reminds me of wacke. EDIT: Actually, I might be on to something. I read that wacke is a loosely held together sandstone within a clay matrix. Maybe that would explain the redish brown areas? As Sealeaf suggests, find out if it evolves bubbles when vinegar is dropped on it, for a start. Then we can rule in or out CaCO3 in its various manifestations. It does nothing when immersed in vinegar. 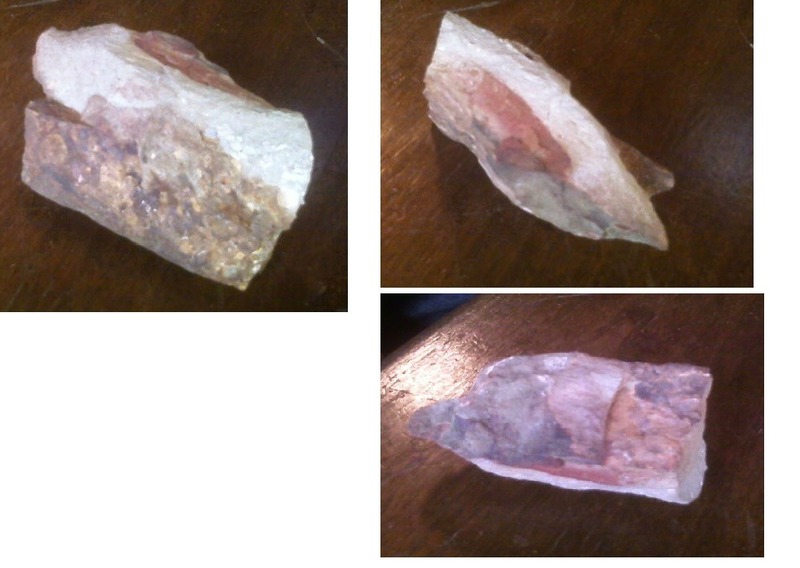 It is from Alabama which would probably suggest the redness, if my understanding is correct in thinking it may be clay. OK so not limestone etc. What is the geology of Alabama? Where exactly did it come from? I got it from a wall of rocks behind my house. But I do think the rocks came from within Alabama. The southeast (Alabama in particular) is known for its very red, and very rocky soil. Most of the southern portion of Alabama is alluvial deposits from further north. Very clearly no Kyanite. It doesn't show the basal or terminal cleavage, or the fibrous crystaline structuring.